Odaiba is a large artificial island in Tokyo Bay. Conceived to house offices and headquarters of big financial companies in the late 80s, it turned out to be a huge under-utilized area after the economic crisis that hit Japan in the early 90s. Since 1996 the metropolitan government had tried to convert it into a leisure area, favoring the opening of shopping centers and various attractions. They succededed, and today Odaiba is one of the most popular areas of the city, packed with places of interest and tourists throughout the year. Odaiba is a neighborhood that offers lots of opportunities for recreation, if your goal was to see all that this island has to offer, just one day would not be enough. There are huge shopping centers, museums, parks and beaches on the sea with fantastic views of the city, futuristic buildings, convention centers, museums, spas, and more. Sega Joypolis Buy tickets for the Sega Joypolis online 10% Off An indoor theme park, based on advanced video games, special effects and virtual reality. It was completely renovated in 2012, so if you've been there before then, you can go again. The admission ticket costs 800 yen, plus the cost of every single attraction you decide to try. You can also buy an unlimited pass for all the attractions for 4,300 yen. You can save money by going late in the afternoon or by buying tickets in advance on this website. An area located on the 4F of the shopping center, here do not be fooled by the word "museum". In this place you can freely enter and inside you will find 6 restaurants that offer takoyaki with different toppings. There is also a corner where you can buy souvenirs and everything you need to cook takoyaki at home. Buy tickets for the Madame Tussauds Tokyo online 30% Off On the 3F of the shopping center there is the Japanese branch of the world's most famous wax museum, originally from London. Entry costs 2300 yen but you can get a 30% discount by buying it online. Opening hours 10-21. -Mori Building Digital Art Museum: Epson teamLab Borderless, the most recent attraction of Palette Town, open in June 2018. A wonderful place to admire incredible works of art created by computers and projectors. Read more about the Digital Art Museum. The most recent shopping center in Odaiba, opened in 2012. In addition to the various shops and restaurants, this mall is super popular thanks to a giant statue of Gundam Unicorn (19,7 high) outside. 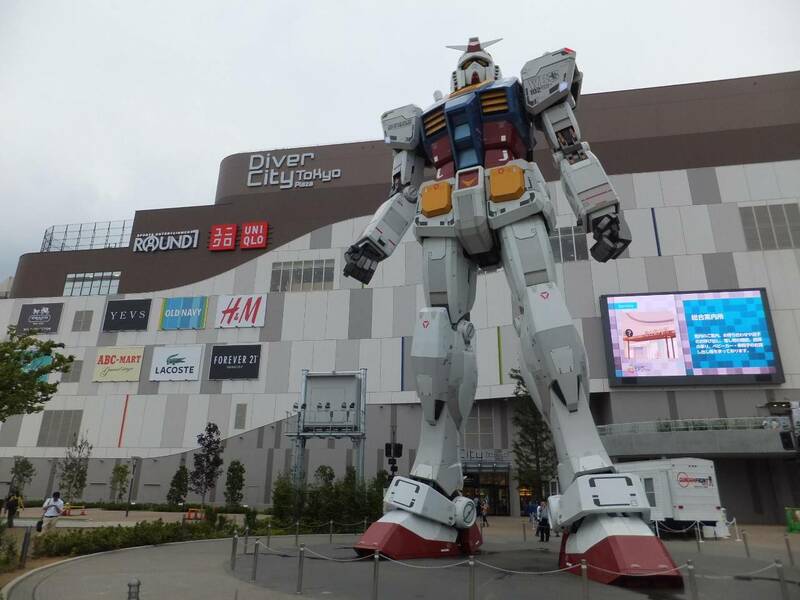 Until April 2017 there was a different statue of Gundam RX-78-2. On the 7F there is an area called The Gundam Base Tokyo (opening hours 10-21), basically a large store where you can find any kind of merchandise dedicated to the famous robot, as well as gunpla models. There is also a gallery where to find all the Gundam model kits ever placed on the market, and a few other things of interest aimed to the fans of the series. If you don't know anything about Gundam, just a few minutes are enough to visit this place. On the 2F there is also a Gundam Cafe (another Gundam Cafe is located in Akihabara). This shopping center is located opposite the famous Fuji TV building, and also includes a multiplex cinema. On the 5F, among the various restaurants, there is also a special area dedicated to ramen called Tokyo Ramen Kokugikan Mai, where different restaurants serve different ramen (a complete list here). This museum once included a large collection that has been closed until further notice. Currently only a small area is still open, and for this reason the admission is free. An icebreaker that can be visited internally belongs to the collection. (admission 620 yen, opening hours 10-17, closed on Mondays). A museum about science and in particular dedicated to those branches most projected in the future such as information technology, biology, robotics, the exploration of space. Many exhibitions are interactive and have an educational purpose. One of the most famous pieces on display is the famous robot ASIMO. The most recent attraction of Palette Town, inaugurated in June 2018. A wonderful place to admire incredible works of art created by computers and projectors. Inside there is also a tea house where you can taste one of the most exciting teas of your life. More information on the dedicated page. I point out some very futuristic architecture buildings. 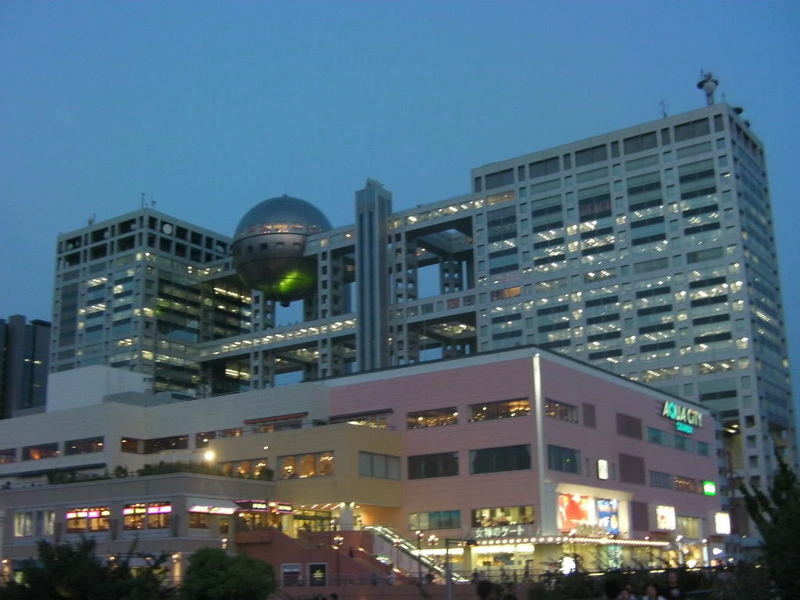 The most famous is certainly the Fuji TV Building, headquarters of Fuji TV, designed by Kenzo Tange, a "symbol" that appears also in some animes. However, unless you live in Japan and usually watch Japanese television, these attractions may be a little boring, because you have no idea about what you see. More interesting is the futuristic observatory deck within the "sphere" at the 25th floor, the admission is 550 yen. Opening hours 10-18. Another building which is worth mentioning is the Tokyo Big sight, an exhibition center with a very futuristic architecture, where it takes place also the famous Tokyo International Anime Fair. Visit the official website for the calendar of events. Lastly, I point out the Telecom Center Building, another modern building with an observation deck (500 yen, 15-21, 11-21 on weekends, closed on tuesdays), and the Panasonic Center (http://panasonic.net/center/tokyo/), a Panasonic showroom with an area dedicated to Nintendo, something like the Sony Building in Ginza. This is a very large spa park. Inside, there are many restaurants and souvenir shops in an environment that reproduces the Tokyo Edo period, but the main attractions are the various pools of thermal water. To enter into the various pools you must follow the rules of traditional Japanese bath. Another peculiarity is that in practice is open 24 hours on 24, it is closed only between 9 am and 11 am for maintenance. You can not enter between 2 and 5 at night (but if you entered before you can stay inside). It also offers rooms to rest, both traditional (a bit expensive), and capsule hotel-style. Entrance fees (only onsen): 2400 yen, 1980 yen if you enter after 18. If you keep staying after 2 am (without getting a room) you pay an extra fee of 2000 yen, otherwise you just pay the price of your room (a capsule hotel-style bed costs 3900 yen). Undoubtedly one of the most charming places of Odaiba, beyond all the shopping malls, is its waterfront, characterized by an artificial beach that, however, is not recommended for bathing due to pollution, and by a coastal park assuming different names, Higashi-yashio park, Shiokaze park, Kaihin park. This place is something fantastic at sunset. 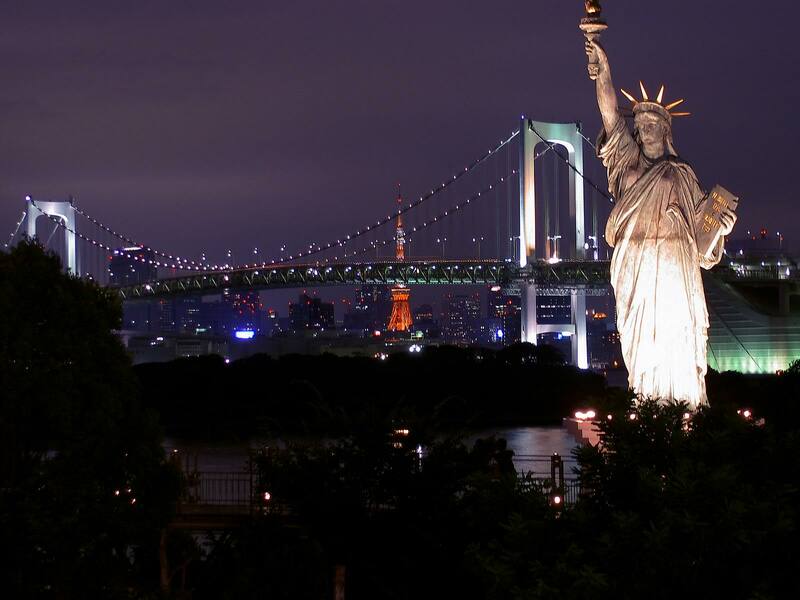 I also point out the presence of a replica of the Statue of Liberty: between April 1998 and May 1999, France "loaned" to Japan a copy of the statue of liberty because of some anniversary. Because of the popularity it had achieved, another replica was built in the same place where the French one had been placed. In Odaiba there are some great modern high-level hotels with quite high rates: the Grand Pacific Le Daiba hotel (double rooms from 24,000 YEN) and the Nikko Tokyo hotel (double rooms from 26,000 YEN). You may opt to spend a romantic night with views over the bay of Tokyo with your girlfriend or with some Japanese girl. Anyway I don't recommend you to stay in Odaiba for more than one night, because of its bad position compared to many parts of the city. One more particular option (to do for one night only too) is to sleep inside the Onsen Monogatari (see the paragraph above). You can get to Odaiba across multiple solutions. The island of Odaiba is connected to the mainland by the Rainbow Bridge, that you can cross on foot walking on the sidewalks on either side of the road. It takes about half an hour to arrive in the area of the waterfront and shopping centers of Odaiba. The bridge is open from 9am to 9pm in summer and from 10am to 6pm in winter, the crossing is free and you can't cross it by bicycle. You also have to choose if you want to walk along the "sidewalk" north or south of the bridge. From the north walkway you will enjoy a better view of the skyscrapers of the city. Unfortunately, the sidewalks are on the side of the road all the way then you have to breathe constantly the exhaust of vehicles. The nearest station to the entrance of the bridge (on the mainland) is Shibaura-futo station served by the yurikamome. The Yurikamome is an automatic train (without driver) that connects the station of Shimbashi with Toyosu station, passing through the skyscrapers of Shiodome, crossing the Rainbow Bridge, and passing by all the stations in Odaiba; The view from the trains is very fascinating, especially from the "head" of the train. Get off at "Odaiba-kaihinkoen" or "Daiba" station for the waterfront, the Fuji TV building and all the main shopping centers; get off at "Fune-no-kagakukan" station for the Museum of Maritime Science, at "Telecom center" for the Telecom center and Onsen Monogatari, at Aomi for the ferris wheel, at "Kokusai-tenjijo-seimon" or "Ariake" station for the Tokyo Big Sight and the Panasonic Center. Anyway, if you get off at any of these stops except for the last two stops that are a bit further away (do not go beyond because then there are only industrial areas), you can reach any interesting point of Odaiba on foot. Leaving from Shinbashi, the Yurikamome costs between 320 and 380 yen depending on where you get off. You can also reach Odaiba by boat, from Hinode Pier (20 minutes, 400 yen) or from the Sumida River in Asakusa (1 hour, 1500 yen).